It also will allow you to read Alcohol results in 2 minutes. 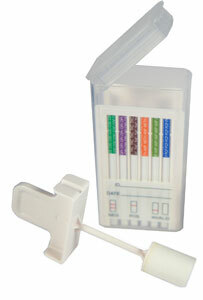 This Oral Cube One-step Drug Test Oral Fluid Drug Screen Device is so easy and convenient to use. It eliminates cross-gender collection issues,non-invasive,no instrumentation, and best part of all is it is a ONE STEP collection and testing drug test! It is convenient to administer anywhere and anytime with results in 3 minutes. The test is inexpensive compared to urine drug testing when the cost of the collection site and the drug test itself are considered.